There is no check. Was it a victory on time? Or did Shirov resign? In all the discussion over this game it's just accepted that Kasparov won, without anyone mentioning the reason for his victory. And it is so often called a great game, whereas I don't see any great brilliance. Just 2 guys trading blows. There's hardly a significant difference in material in the final position. Shirov resigned: the thinking was that despite both sides left with pawns and a knight, the advantage went to Black. Black has an extra pawn and Black's pawn chain is mutually supporting. White is down a pawn and they are split. White's king is buried too deeply in the corner to either prevent a black pawn advance to promotion or to save White's pawns. True, White does have a pawn that is more advanced, but Black's king is already central, pretty much attacking the pawn and knight. The white knight is insufficient to protect that pawn. That pawn is pretty much gone, so really Black's advantage effectively becomes two pawns. With White's advanced pawn gone, advantage becomes three black pawns and a knight against White's single king-side pawn and a knight, except even here Black's knight is already attacking that pawn so it, too, is effectively gone. Kasparov would truly have to make some blunders to fail to promote a pawn, so pawn promotion was seen to be unavoidable given the position. Hence White resigns. Black has (almost) three connected passed pawns which will be unstoppable. White is not going to promote his pawn without the king, which is far away and likewise is not going to get a passer on the a or b file soon. Think of white's next move. The pawn in g is lost. 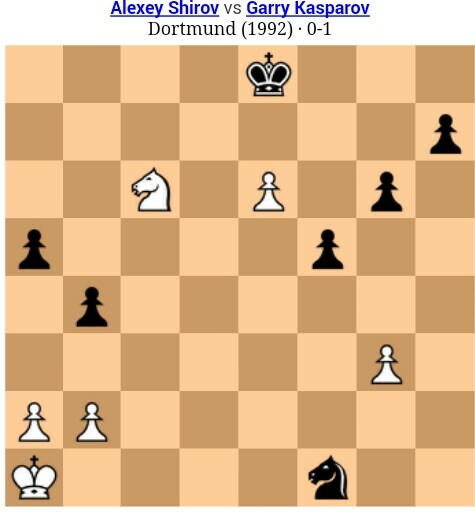 If you move the pawn in e, black just leaves the king there and the white knight is pinned. So the only reasonable move is b1, to start taking the king to where the action is. Black can now take the g pawn and start advancing the three pawns to get to promote one of them. I might screw that up, but not a GM. Shirov resigned. Black's next four moves will be Nxg3, (unless White advances the g pawn, in which case Black plays e5xg4), Ne4, Ng5, and Nxe6, unless White moves his N to protect it, in which case Black moves Ke7. White's best plan is to activate his king to b1, c2, b3, and a4.So White's king is at a4, his N at c6 with two pawns in a2 and b2, having lost both his king side pawns. Black has a N at e6 and a K at e8, two queenside pawns and three king side pawns. White takes two Black pawns with his next two moves, Ka5 and kb4. Black plays his h pawn to h5 and h4. White moves his N to e5 Black pawn to h3, White N to f3, temporarily blocking the pawn. B moves g5, "chasing" the WN, which goes to h2. The white knight can take a5 whilst black moves g5. If white tries to rush the pawn to a4 black takes en-passant. This leaves the black king to atack e6 and the black night to attack g3. But pawn f4 signals the start of black pushing it's pawns forward which creates a queen on the same diagonal as the white pawn being pushed along the b column. If blacks turn is first then game over already, night takes f3 and pawn pushing asap. Of Course Shirov resigned in this Position . Black has got three Connected Pawns on the K-side to which White has only one and it will fall soon . The Black Knight makes it more difficult to stop those Pawns . The White King is cornered out on a1 and it will never reach on time to stop any of the black's Pawns . As far as Q-side is concerned the Pawns on a2,b2 are blockaded by a5 & b4. The White Pawn on e6 though far advanced is just a hollow threat which coordinated by Knight is not enough to tie the monarch . Once the White Knight moves the King occupies the e7 Square . The entire play is on Black's side and White has to wait for his fall fighting till the end only to loose . Not the answer you're looking for? Browse other questions tagged endgame famous-players kasparov famous-games or ask your own question. Are there any chances that the Fischer who reappeared in 1992 was not the real one?